Violence And The Jobstown Anti-Water Charges Protest. Should this violence be criticised? It is clear that the governments is seeking to split the anti-water charges campaign by modifying the water charges and publicly attacking any violence surrounding the protests. A public attack has been mounted by figures from the government parties against the Socialist Party because of the violence surrounding the protest against water charges in Tallaght.These figures, including Joan Burton, claim that the protest had a violent nature and that Joan Burton was subjected to a physical attack and intimidation by the protesters. The SP claims that generally the protest was peaceful and that a few non-protesters were responsible for the violence. It declares that it is against the use of violence such as water bombs being lobbed at government figures. The Socialist Party exposes its true colours by attacking the use of such violence against government figures. The point is that such attacks should not be criticised by those that defend the interests of the working class. The violence manifesting itself last Saturday is a product of the oppression of the people of Jobstown by capitalism under the political leadership of the current government. It is this government and the system it represents that was the cause of the violence. The violence is a product of the anger generated by the oppression and alienation of the people of Tallaght. There have been cutbacks in benefits, enormous unemployment and low wages, among other things, inflicted on it by the present government. If no water charges were being imposed there would have been no protest and thereby no violence. It is this that the Socialist Party should be pointing out instead of abjectely opposing the violence that took place. Why should a party that claims to support the interests of the "the ordinary people" express its opposition to attacks on government figures such as Burton and Kenny? It is not the job of communists to protect government figures. No, the organizers of a law abiding protest are NOT coming out against the other sort of protest if/when they are objecting to the other sort making it impossible for them to hold a law abiding protest. BOTH are tactics that may be useful, and even if we disagree about that (how useful) certainly those who want to do either sort should be allowed to do so. But those who are trying to do a law abiding protest are hindered in their preferred tactic if the other sort are using them for cover to carry our their tactic. Those of you who favor more forceful means need to take that into account and not do your action in a way that interferes with other protesters. Oh, you say, separating ourselves out like that would make it too easy for the authorities to come for us. We want/need innocent bystanders to hide behind. Sorry, you are out of line there and doubly so if you then attack those you were trying to hide behind for criticizing you. Understand? I am NOT criticizing your tactic in and of itself (attack with water balloons) but whether you needed more separation between yourselves and other protesters. The double standards of Water Balloons and violent police. what happened in tallagh was not violent or i'm not sure what your definition of violence actually is? violence otherwise those youths would of been arrested without doubt. i would also say that anger is justified in that marginalized community. This was true violence when a Woman protester stepped in front of a the taxpayers ministerial car. The young women was violently flung to the ground by three large policemen and was seriously injured when she struck a pole. No sense of outrage here when a citizen excercises there democratic right to protest.on such a contentious issue. Of course the mainstream media and political establishment will seize this to try and divide the movement, to set ‘good protester’ against ‘bad protester’. We reject this. The real issue is why is this unpopular tax being imposed and why is Garda violence being used against those who dare to protest. Yes the establishment has chosen to escalate rather than back down, our approach must be unity in the face of that attack and rejection of any attempt to scapegoat those the state tries to criminalise. the person who threw brick at car, was it unrelated?? 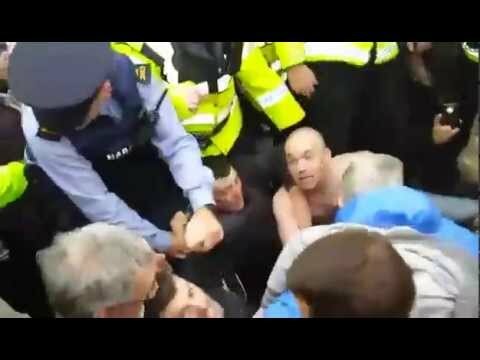 Apparently the gardai discharged a previously standing warrant and arrested a young man in the vicinity of the protest. garda car in response to the arrest of their friend. Why did the gardai chose this time to discharge that warrant? It's a poor area, there were a lot of people on the IW protest earlier. the media were about bristling with cameras and no doubt the young man's mates were about, annoyed that their friend was nicked and sitting in a garda car, and likely no friends of an Garda siochana either!! a provocation to get a response which could be "media linked" to the protest perhaps? The brick was thrown AFTER the protest but the media are intent on conflating the incident with the protesters. Disgusting!! The media showed their true colours in their portrayal of the protesters and their distorted use of language. No doubt this child's water balloon will be used as the excuse to beef up police presence at future protests as is always the case. Perhaps now more folks will begin to understand the pattern in what happened to the shell to sea protesters when the media began to demonise them whenever they protested, and how the gardai got ever more brutal and their numbers got ever larger. Beware of agent provocateurs in your midst advocating violence coupled with the presence of presstitute media. Agent provocateurs are often people undercover in state employment. They act genuine but use their influence in the group to steer protests towards acts which will discredit the movement then compliant media demonisation does the rest. Learn form the rossport experience, protest peacefully but assertively. Paddy wants you to "do as thou wilt" but that just plays into the hands of the media and the government. There is really no point in going off half cocked at a water protest. It's just dumb behaviour. I don't know what the hell Paddy is up to here, but quite frankly it stinks of provocateur behaviour to me. Violence has it's place in protest when all other avenues of redress are exhausted, but it is certainly not required to win this battle. The government is quite clearly under pressure. All that is required in this campaign is to just keep up the large numbers and non violent protests and they will undoubtedly fold. Then maintain the positive feeling of power this gives you and fight them in the same manner next time they try it on. Because the fact is, the people really do have power but only when we coalesce. We just have to exercise our power together . Then No Government, however corrupt or violent, can resist us.. The water balloon was nothing. Kids throw those at each other. But you have to remember that the ruling classes live in deep fear and paranoia of the people rising up because they know that they have routinely lied to the people what they are up to is wrong and that they are taking advantage of the people for the gain of a few. They know that if it was them on the other side things would indeed turn violent. But it is to the credit of the Irish people that 99.9% of them remained dignified and peaceful while making their power felt and sending a chill up the spine of the political class. Keep it up folks. 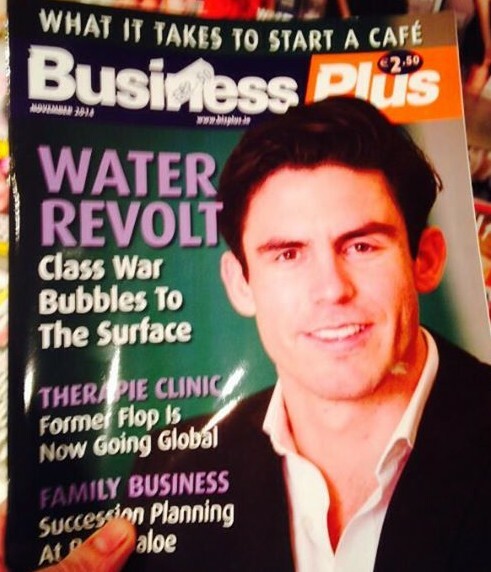 How does the above relate to coverage of the Jobstown protest I wonder!! ...sectors of the doctrinal system serve to divert the unwashed masses and reinforce the basic social values: passivity, submissiveness to authority, the overriding virtue of greed and personal gain, lack of concern for others, fear of real or imagined enemies, etc. The goal is to keep the bewildered herd bewildered. It's unnecessary for them to trouble themselves with what's happening in the world. In fact, it's undesirable -- if they see too much of reality they may set themselves to change it. There's a war happening in the media at the moment and there was a moment on RTE's Prime Time last night that exemplified this, a woman in the audience described women being assaulted by Gardai on her estate. She specified that they were not near the IW workers when it happened and the ex Fine Gael woman Gemma Hussey basically scoffed at her and said something to the effect of, 'yes becasue you were blocking workers that's why it happened'. The woman didn't retort probably because of the temporary shock and confusion this kind of comment causes, which is the desired effect. This is 'gaslighting' and it's been used by a lot of Fine Gael td's in debates in relation to the water charges and other issues, I don't know if it's linked to NLP training that they're getting or if it's just instinctual. It's basically taking taking something that somebody has said and flipping it back on them to paint them as the perpetrator as opposed to the victim. 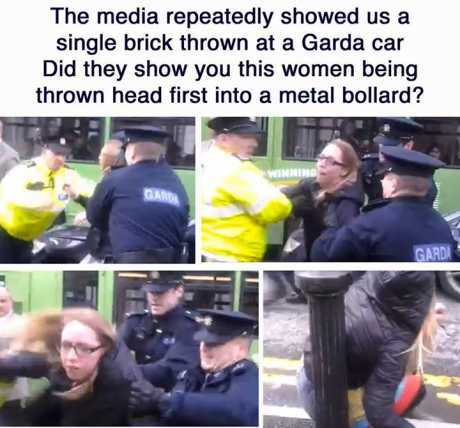 It happened with the woman who was flung outside the mansion house also, there were comments such as 'she shouldn't have been near the car' or ' The gardai were only doing their job', she was callously manhandled and thrown towards a rock hard object and somehow it was her fault!. Gaslighting is used by psychopaths and proto-psychopaths in the home, the office all the way up to the Daíl and if more people were aware of it the easier it will be to shoot down in debates. 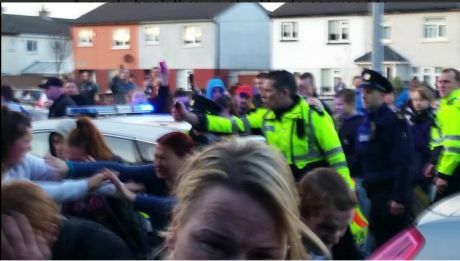 The unrest at the Jobstown protest was blown out of all proportion and the arrest of the teenager was very suspect in it's timing. The media will try and frame the debate and feign horror at a water balloon being thrown and the gaslighting will continue. I don't envy Paul Murphy as they will throw everything they have at him with this and try and paint him as a devil as a distraction as much as anything else. The real proof of this campaign will be if the critical mass of people refuse to pay the bills when they arrive, to see the government defeated on this would be sweet, sweet wine and to see them having to call a general election would be even sweeter. 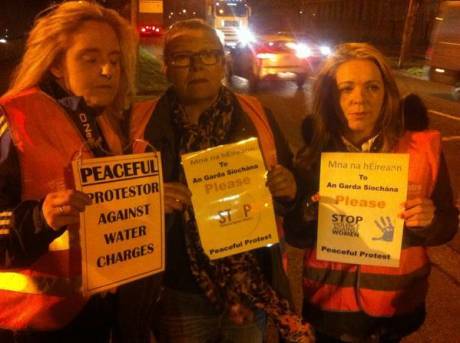 Around 60 water charge protesters are in a standoff with contractors in Donaghmede in Dublin. rish Water said 90 contractor staff are being prevented from carrying out work in the Grange Road area. The protest followed a similar action yesterday when workers with GMC/Sierra were prevented from leaving for nine hours. There are 13 vans parked on Grange Road and local protesters prevented vans from leaving by standing in front of them when they tried to move. The vans and uncompleted meter installation sites have notices of a High Court order warning protesters not to interfere.